Are you ready for the impending snowy weather? Are you able to warm your car or truck’s interior with the press of a button within the comfort of your home before heading out the door? Or, in most cases, from your smartphone! If not, and you’re curious about getting a remote starter properly integrated into your vehicle, give us a call or shoot us a message to inquire about options and price. We are an authorized Compustar Pro Dealer, and are excited to announce we are also now an authorized Viper Preferred Pro Dealer. This gives us the ability to offer you the best of both worlds. Whatever choice you make, you can feel confident that you will get a safe, properly installed system covered by a full (as long as you own the vehicle) Infocus Audio Lifetime Warranty on parts and labor, and never never have to worry about your vehicle’s factory warranty being affected! Protect your car’s contents, start its engine and prepare the temperature inside your vehicle from the comfort of your home or office. The PRO 1-WAY G7 Remote Start + Security System gives you the ability to remotely start and secure your car from up to 3000 feet away. So whether you're at home or the office, you will always be within range of your vehicle. The G7 remote features a durable casing that will resist drop impact and water damage. Even in tough conditions, your remote will be ready to arm your security system. 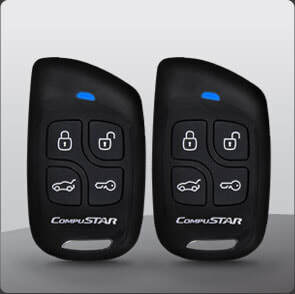 Request a quote today for a Compustar RF-P1WG7-SP remote start and security system. Add extra convenience and security to your vehicle with the 1BAM Remote Start + Security System. The 1BAM remote is a 1-button transmitter that will give you 800 feet of range for starting and securing your vehicle. The 1BAM remote's small, compact design will make it a convenient addition to your car's keychain! Request a quote today for a Compustar RF-1BAM remote start and security system. Are you looking for an easy way to secure your car and add remote start? The 1-WAY G6 Remote Start + Security System is Compustar's best-selling option for customers looking for a way to easily add convenience and security to their cars. The G6 remote has a range of up to 1000 feet, which is up to 10 times the range of your car's original remote. 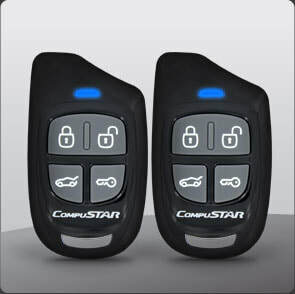 Request a quote today for a Compustar RF-1WG6-AM remote start and security system. The 2-WAY 9000 Remote Start + Security System captures everything that has made Compustar one of the top brand of remote starters and security systems: quality, innovation, and reliability. The 9000 remote made Compustar a pioneer in the use of Spread Spectrum Technology to send commands to vehicles from up to a mile away. 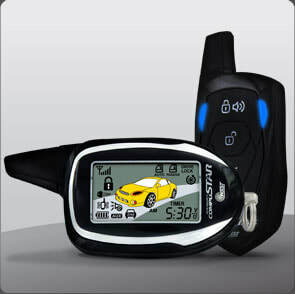 Whenever you send remote start or keyless entry commands, this system provides instant visual and audible confirmation via the 2-WAY 9000 remote's LCD screen. Also, if your Compustar system's door and shock sensors are triggered, you will receive an instant alert and notification on your 2-WAY 9000 LCD remote. 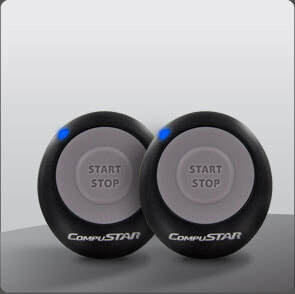 Request a quote today for a Compustar RF-2W9000-SS remote start and security system.